House OA7 at the eastern side of the palisade; post holes and pits stand out as darker markings, rich in organic matter in the soil just below the plow layer. Photo: Anne Pedersen. 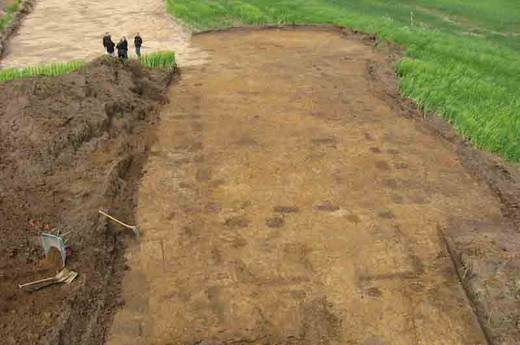 The Jelling excavations of 2010-11 revealed traces of four Viking-Age buildings, which we believe are associated with the palisade and thus constitute an important part of Harald Bluetooth's royal estate. The three of them lay parallel to the palisade and had a very distinctive shape, similar to the houses known from the so-called Trelleborg fortresses (Aggersborg and Fyrkat in Jutland and Trelleborg in Zealand). The last building stood roughly at right angles to the eastern side of the palisade and is of a type that we know from barns, workshops or stables on Viking large farms. Three of the four buildings ̶ two of the Trelleborg houses (called OA6 and OA7) and the smaller building (OA8) ̶ were completely undisturbed by later activity. It was therefore an ideal opportunity to take samples of the soil inside and outside the houses to see whether activities had left traces in the form of specific elements in the soil. 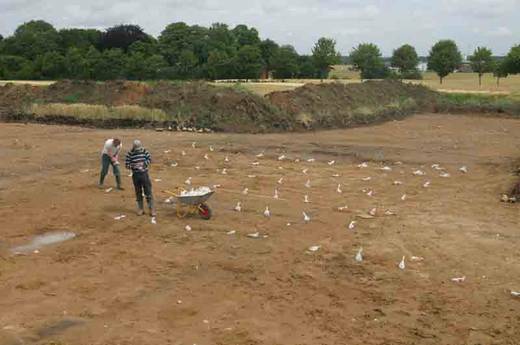 A network was laid out for each house, and soil samples were systematically gathered. Sampling at the house OA6, the easternmost house within the northern course of the palisade. Photo: Jørn Kjaer Nielsen, Movision Film & TV. 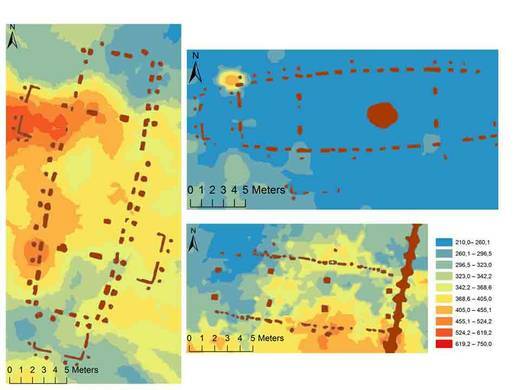 Preliminary results from studies on metals and other chemical elements in the soil in and around the three houses show that the prehistoric activity here, with the exception of holes dug for the posts of the houses, did not leave many traces. There is nowhere an actual soil contamination with heavy metals or other elements in the area. On the contrary, natural variations in the soil might explain most of the patterns that we see in the elemental distribution. Inside the houses, there is no trace of metal workshops or storage of fertilizers and livestock. However, despite the absence of significant differences in soil elements today, there are still some patterns that give an insight into the use and function of the house. Phosphorus concentrations in the soil have been used to detect prehistoric activity since the 1920’s. Phosphorus distributions in fact, provide the most interesting picture in the area, both within and outside the three buildings. House OA8, the small special building, has not left any distinct pattern in the underground. Certainly, there is a tendency for higher phosphorus content in the soil outside the house boundary than inside; however, this may be associated with a natural change in the soil. In the soil under the house OA6 (near the northern palisade) the only apparent phosphorus enrichment can be seen immediately outside the NW corner of the house. Nothing suggests that this is natural; instead it must be due to the addition of material rich in phosphorous, such as bones and household waste. Phosphorus in the soil around the three buildings, respectively OA6 (top right), OA7 (left) and OA8 (bottom right). The samples were taken immediately below the plow layer. Concentrations are given in mg per kg of dry soil. Post holes and other pits are shown in red. The content of phosphorus in the soil in the Danish farmland and grazing land - with the extraction method here selected - is in the median, respectively 605 and 565 mg P per kg of dry soil. The aluminum in the soil around the three buildings, respectively. OA6 (top right), OA7 (left) and OA8 (bottom right). The samples are taken immediately below the plow layer. Concentrations are given in mg per kg of dry soil. Post holes and other pits are shown in red. The content of aluminum in the soil in the Danish farmland and grazing land - with the extraction method here selected - is in the median, respectively of 5642 and 4188 mg P per kg of dry soil. The picture at house OA7 at the eastern side of the palisade is more complicated. This is certainly related to natural variations in soil texture and minerals in this area. This variation is evident for example in a diffuse SE-NW oriented corridor under the house, where there is more aluminum, barium, calcium, strontium and other elements that should be a natural part of the soil at the site (see figure). The phosphorus content also shows a slightly different pattern with elevated numbers that can be interpreted as traces of human activity in and just outside the western porch of house OA7 (leading into the palisade area). There has clearly been an activity here which has impacted the ground. What happened exactly is not clear, but several other elements, such as thorium and uranium, are slightly enriched in some spots here and the statistical analysis suggests that this pattern does not follow natural gradients. Overall, this may mean that some fine-grained material that does not naturally belong on the field has been added to the walls or floor of the buiding. Perhaps there was a clay floor here? The added material was later incorporated into the plow layer, but it may nevertheless have left weak signs further down, as earthworms have gradually transported a minor fraction of it into the subsoil. The conclusion of the analysis is that the houses have few significant traces of human activity, in contrast to the picture we know from other contemporary cities. At the same time, some options for future analyses can be pointed out. One should, for example consider investigating the cause of phosphorus enrichment immediately outside the northern side of house OA6 – Was manure or perhaps household waste disposed of here? Also the westernmost part of house OA7 should be investigated to determine whether any clay or other building material was added to the house. Evenly distributed samples of soil were taken across the three houses and 27 chemical elements were analysed. A total of 455 soil samples were dissolved in a laboratory by means of a so-called aqua regia digestion, and the metals in them have been investigated. 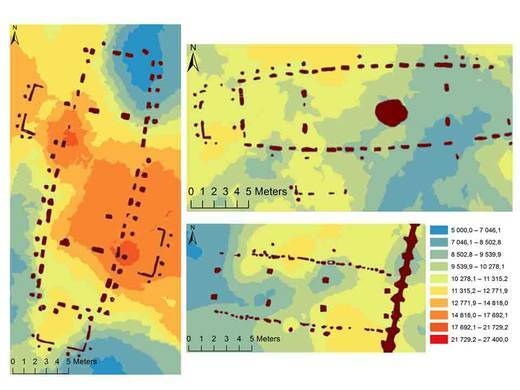 Data of elemental concentrations in the soil have been analysed partly with a statistical principle component analysis showing which elements were found together, partly through maps showing their distribution in and around the houses. Such an approach with many elements makes it easier to distinguish between signs of human activity like phosphorus from fertilizer/cooking or metals from workshops and the underlying natural variations. This can be recognized in greater detail than in those studies where the emphasis is on a single element or just few samples.